The players were accused of stealing sunglasses from a Louis Vuitton store while they were in China for a game. Three UCLA basketball players who were detained in China for shoplifting have returned home. President Donald Trump spoke to Chinese President Xi Jinping about their case during his diplomatic trip to Asia, which may have helped secure their release. He later tweeted: "Do you think the three UCLA Basketball Players will say thank you President Trump? They were headed for 10 years in jail!" The three players, who include LiAngelo Ball, the brother of NBA player Lonzo Ball, were allowed to return to the U.S. on Tuesday. In a press conference Wednesday they read statements of apology and gratitude to the president. 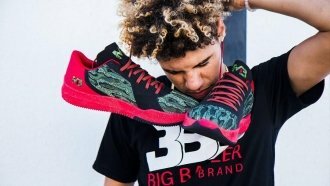 LiAngelo Ball said: "I didn't exercise my best judgment, and I'm sorry for that. ... My family raised me better than that. ... I'd also like to thank President Trump and the United States government for the help they gave us as well." It's tough to tell exactly what punishments these players were facing, but under Chinese law, prison sentences wouldn't have been out of the question. The players have been suspended indefinitely.